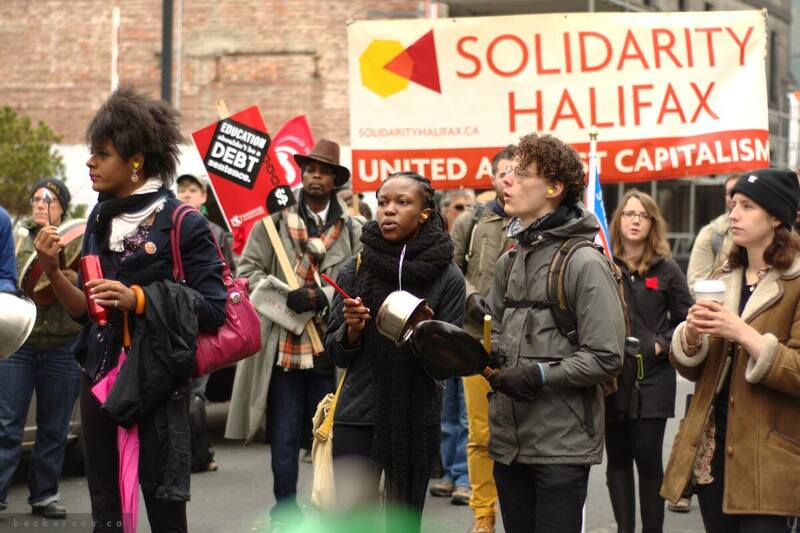 On April 22, the Halifax-Dartmouth & District Labour Council and the Nova Scotia chapter of the Canadian Federation of Students held an open meeting to discuss the NS Liberal government’s austerity budget and the need to fight back. At this meeting, activists and organizers from numerous anti-poverty, student, arts, social justice, environmental and labour organizations launched the #NSuncut coalition. The coalition’s first collaborative task was to mobilize a mass rally two days later at Province House. The noisy rally coincided with the vote to approve the NS Liberal’s austerity budget and to ensure it didn’t get passed quietly or unnoticed. Here’s an excerpt of a speech given by Suzanne MacNeil on behalf of Solidarity Halifax. Transcript from the Halifax Media Coop. “Through this austerity budget, the Nova Scotia Liberals have said that tough choices have to be made. Everyone must pay their fair share. What they really mean by that is that they want working people, children, immigrants, first nations communities, women, students, they want them to pay so that billionaires like John Risley of Clearwater Seafoods can continue to enjoy his tax breaks [and] his benefits. What the tax breaks for the one percent, for the billionaires of this region, mean is that low-wage jobs get created for the rest of us. There’s less money for education. There’s less money for our non-profit sector that makes sure that the most vulnerable get their needs met. There’s less money for students, who are the future of this province. There’s less money for public servants who make sure that the work of this province gets done. There’s less money for health care for everybody. But there’s less money for all of us, the ninety nine percent. Follow the links below to read various media reports of the rally.